Having health insurance is vital to one’s health and financial well-being in the United States. Out-of-pocket medical expenses are the leading cause of personal bankruptcy. Even with new laws such as the Affordable Care Act (ACA)—aka “Obamacare”—11.7% of Americans remain uninsured. Analysts have only recently been able to examine the data of uninsured rates prior to ACA’s implementation to now. WalletHub released the stats for all 50 states and Washington DC and ranked each by their current uninsured rate; Massachusetts is ranked highest with only 3.28% uninsured, and Texas is ranked last with 19.06%. In numbers, even the last-ranked state Texas reduced children’s uninsured rate by 23.88% and adult uninsured rate by 19.27% between 2010 and 2014. Even with the current highest rate of uninsured Americans, 827,997 people gained health insurance coverage in Texas in the years being analyzed. Over 10,000,000 previously uninsured Americans are now covered under the ACA. In a previous blog post, we discussed how the ACA was helping seniors as compared to 2013—especially in states that expanded Medicaid. 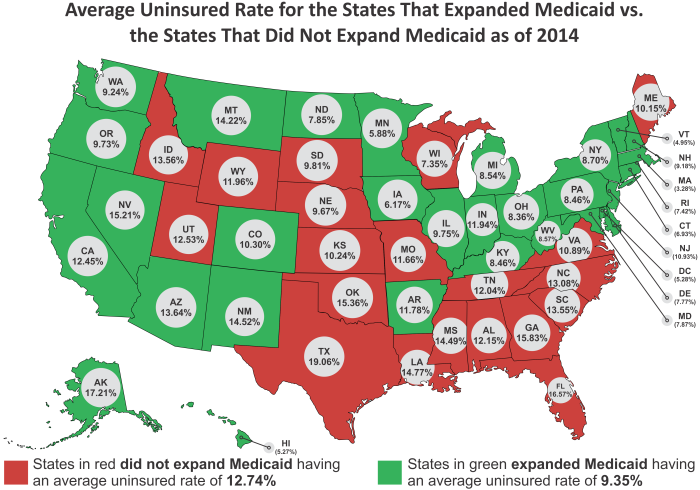 The new numbers illustrate the whole effect of the ACA on the entire population as compared to before the implementation of the law as well as comparing Medicaid-expanded states and states that did not expand Medicaid. NeedyMeds’ mission is to help those facing the high costs of health care. For those unable to afford their medications, NeedyMeds has an extensive database of Patient Assistance Programs (PAPs). NeedyMeds also has information on Coupons and Rebates that can help lower the cost of necessary medications. For those without any prescription coverage, the NeedyMeds Drug Discount Card saves 0-80% on any prescribed medication. A plastic card can be ordered online or requested by calling our toll-free helpline at 800-503-6897, or a printable version can be found on our website as well as a smartphone app on Apple and Android devices.